Great shelf for the price! I bought this to store stuff in our extra closet at work and its a great quality for a low price! Much heavier duty than I thought! 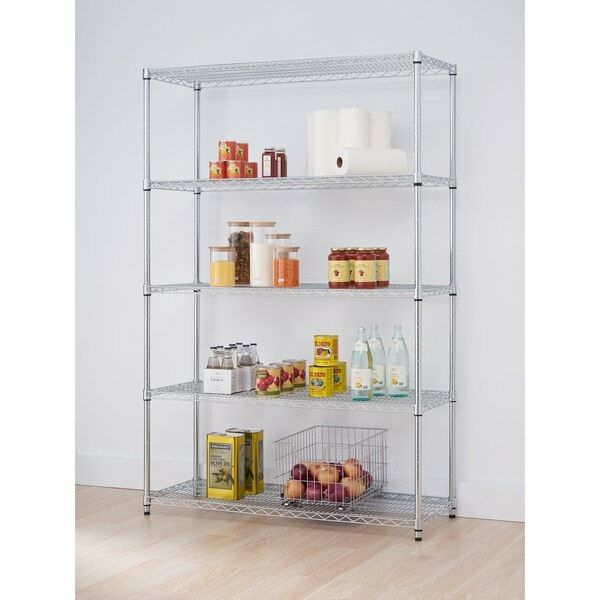 Find room to store your things with this Trinity steel storage rack. 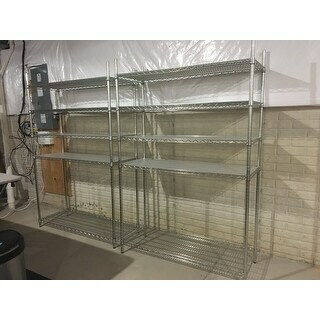 This rack features strong steel construction with a chrome EcoStorage finish and has five wire shelves to provide plenty of room to store toys, tools and assorted gear. These shelves are quite sturdy, assembled very easily and are exactly as described. It took about 30 minutes to assemble the first shelf because I was reading the step by step instructions. It comes with very good instructions. The second shelf went up in about 10 minutes because it’s just that simple to put together. All pieces were present including some extra shelf adjusters. Each vertical pole is actually 2 poles screwed together. But they screw together very tightly and I have no concerns about stability at all. I love that the shelves are able to be assembled at custom spacing! This product arrived quickly and looks exactly like it does online. It is good quality for the price and I would recommend this. I like being able to order online and have items shipped directly to my house. Everything arrived perfectly packaged, ahead of schedule and was super simple to assemble (alone)! Great product made by a company that puts quality and ease of assembly first! This rack was a life saver. I moved into a place that had a one car garage and I had many storage items. It is sturdy and was easy to assemble. I was able to stored so many items on the shelves. The only negative was that it was not on wheels so it was difficult to move when it was loaded with storage. I'D RECOMMEND THIS SHELVING TO EVERYONE. IT'S A EXCELLENT PURCHASE. IT IS VERY STURDY AND EVERYTHING YOU NEED TO STORE ALOT OF ITEMS. I'M VERY SATISFIED WITH MY PURCHASE! Great storage rack for my daughters small city apt. Be careful, the box is very heavy. Great quality and very sturdy. Great to store gear or equipment for the garage. Will definitely be purchasing a few more. Great organization shelf for garage. Bigger and sturdier than expected. "Does the 48 width factor in the castors? I have an opening of 47 so I'm wondering if the unit minus the castors will fit. Thank you." "How much weight does this hold?"